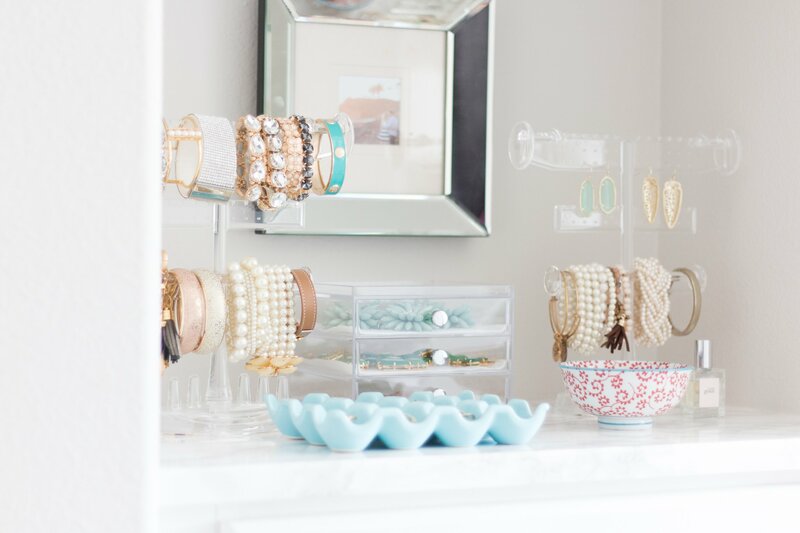 Thankfully I am back much sooner than I thought with an after photo of my jewelry organization. Thanks for letting me share the awful before yesterday. Isn’t it funny how we can put something off for months, maybe even years, and when it comes down to it, the task takes about an hour. I feel so much better and so happy walking into our room. 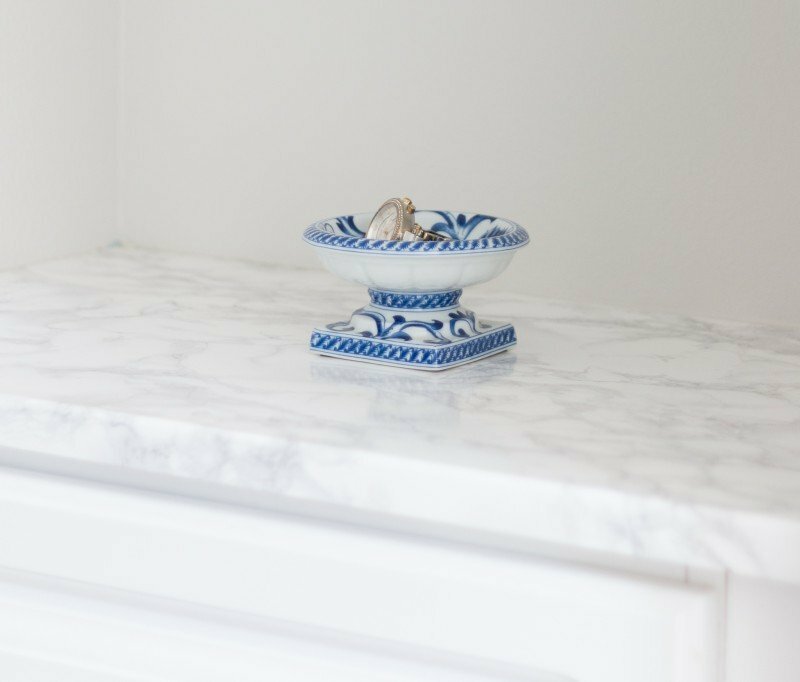 I hope this encourages you to tackle a hot spot in your home. 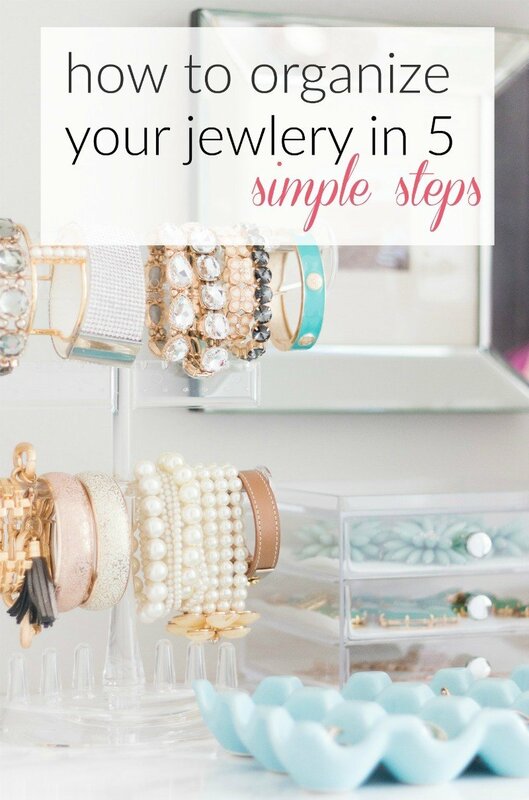 Here is how to organize your jewelry in 5 simple steps. The first step feels so good. I took absolutely everything off of the shelf. I placed the watch back and sort of wanted to walk away and keep it like that. Less is more right?! But alas I would miss my accessories so it was back to work. I had moved everything to the floor so I sat and sorted. With music cranked up while I did this, all I worried about in this step was whether I wanted to keep it in my life. Do I wear it? Do I love it? I created by “keep” pile and my “donate” pile. After I had my donate pile (which sadly wasn’t very big) I placed those items I no longer where in a small tote to take next time I give to a nearby thrift store. Once you have your keep pile, it’s time to sort by item. This will help you realize what your are dealing with and what type of storage you need. It was very clear, after doing this, that I am a bracelet and long necklace gal. I have very few earrings and not many short necklaces. This is all important information because you need to know what type of containers will work. I thought I would be hanging hooks on the walls of this nook for my necklaces but they were all too long for that. My best tip for you is to do steps 1-3 before you ever go near the Container Store or some place like that. I bought a few things prior to doing these steps and they are all being returned. You have to know what you need. Take an actual list with numbers next to each of your subcategories. 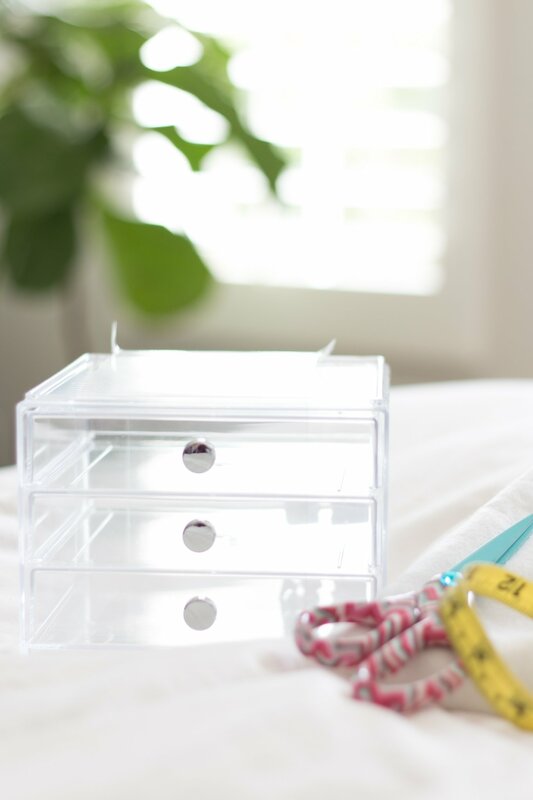 It’s easy to go to those stores and be tempted to over buy or buy beautiful storage items you don’t really need. Also be sure to keep scale in mind. The area I am working with is not large. Some of the organizational items are just too big in scale for this project. After sorting, I knew I needed to go and get a container to hold my nicer necklaces. The ones that were gifts or cost more and I really want to protect from dust. I found this set of drawers for $10 at HomeGoods. My Container Store is not close, so I took the lazy route and headed up the street and it worked out well. I measured the drawers and cut a piece of white felt I had laying around so the necklaces have a soft surface to rest on. I used double sided sticky dots to keep the felt in place. 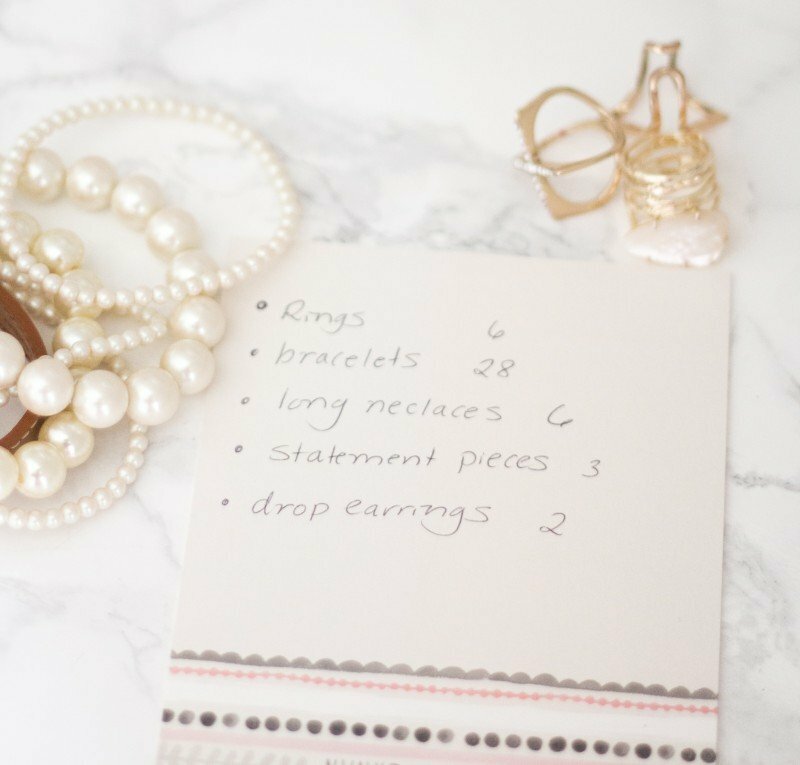 If you have gone to the store with a list of what you own (and how many of each) it is so much easier to shop. I had already picked up these standing jewelry holders from HomeGoods knowing I would fill them with my bracelets. 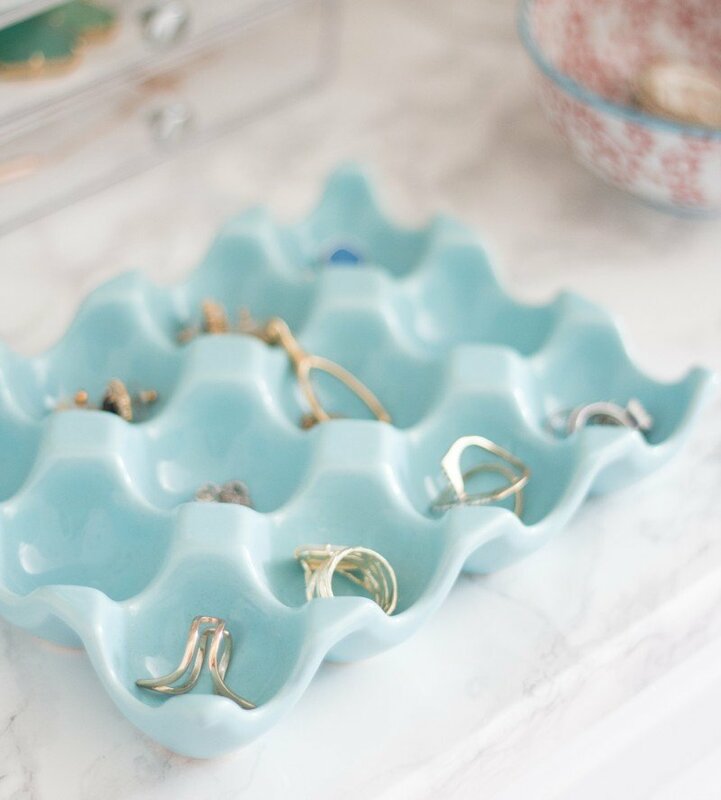 I’ve had this egg crate from Anthropologie for years. 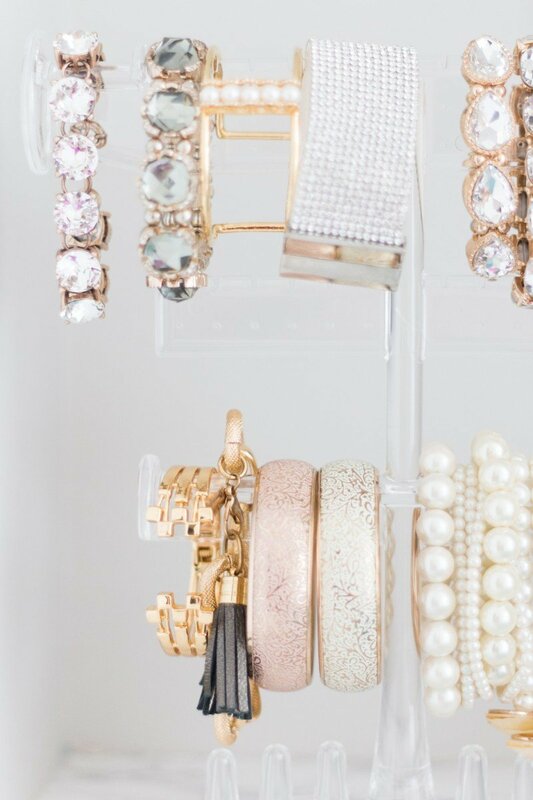 It’s perfect for rings and for dainty chain necklaces. They no longer carry it, but I have seen them at Target. 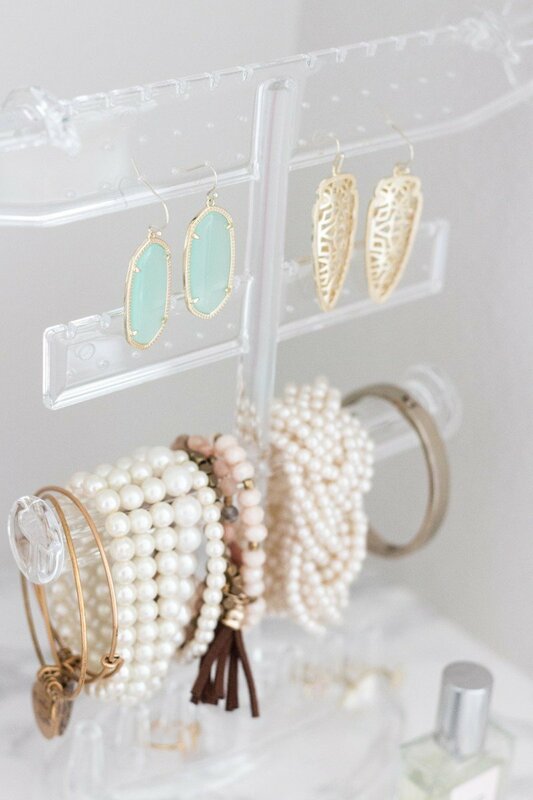 While I don’t have many dangly earrings, this stand did allow me to display those nicely. Can you tell I have a thing for gold and pearls? This was very enlightening! You like what you like, right. Also pretty funny that the only color I really have is green. It may be different hues of green, but they are all green! With a little blush thrown in. This shows you my room with our door closed. My jewelry nook is on the right. The last set of items I had were my long necklaces. They just weren’t going to fit in the nook. So I set out to find a cute set of hooks. This is something I could have made myself but I was more in the mood to grab something quickly so I could finish this area. I found this at HomeGoods as well. They had a great selection of these little signs and hooks. This is now hanging behind our door so it’s not really on display but is easily accessible. Even my kiddos noticed and said it was cute. So funny what they see. 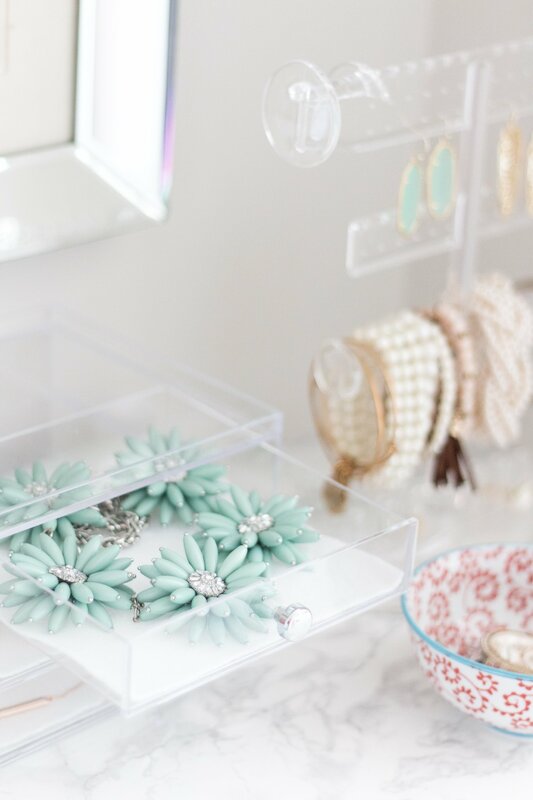 I love this new jewelry space! So much better than the before. I did keep a few more items that are in the cabinet above. But they are things that I wear once or twice a year. I still need to organize the upper cabinet and will show you when I do. Overall, I am beyond thrilled. I spent less than $40 in storage items and I can actually see what I have now. It’s actually a joy to accessorize now! I hope this gives you a little nudge to purge an area that is bothering you. It’s so worth it. Enjoy your day, my friends. Off to choose my outfit and jewelry! Ha. Love this! So adorable. 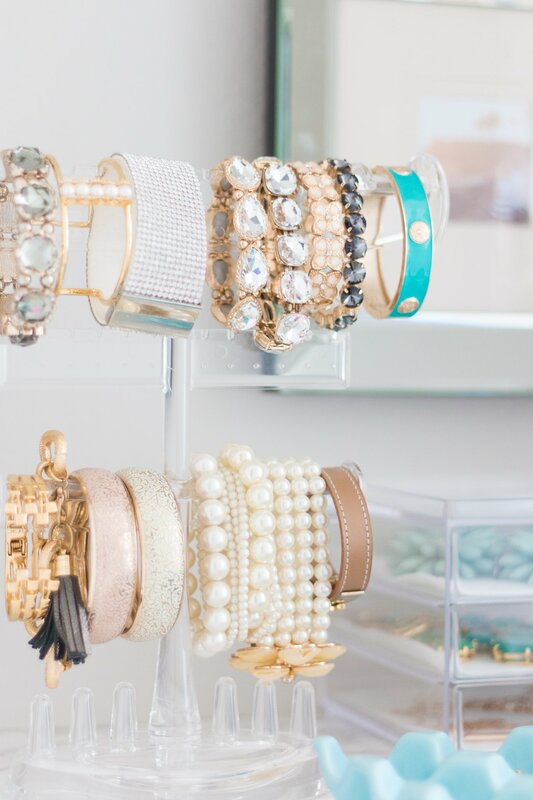 I’m totally inspired to revamp my accessory area. Oh that makes me so happy! That’s the only reason I share. I can’t believe how long I put it off. So embarrassing and straight up silly. But now I love looking at the space so it was all worth it. Sometimes you just have to wait until the motivation strikes. So, so lovely Courtney! I love your ideas and your jewelry. 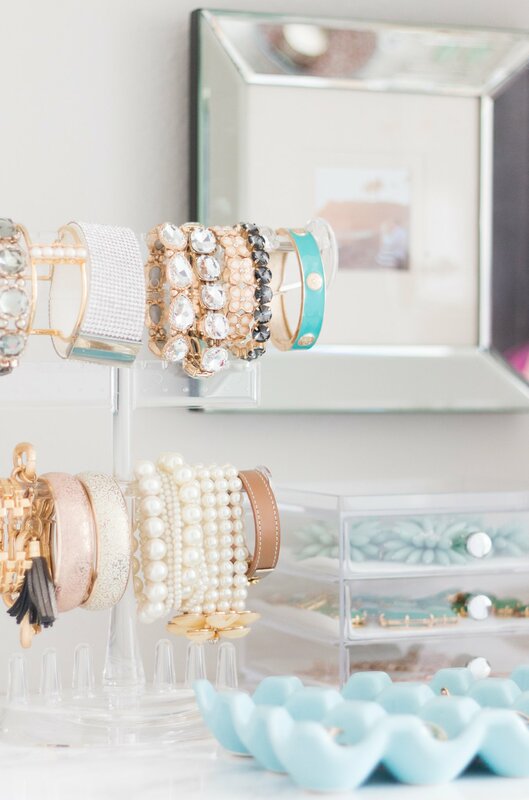 It almost motivates me to organize my jewelry– it’s just that darn purging part! Have a great day! I know! The purging is a bit painful but it feels so good! Thanks for the sweet compliment. Felt good to finally organize something. It’s been far too long. I lost motivation for it for such a long time. 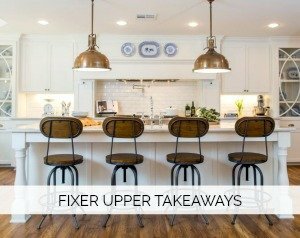 Hopefully this will kick me into gear for other spots in our home that need some love. Wow! Perfect timing for me as I’ve been purging my jewelry as well. And you did that So fast! It is REALLY pretty to look at too, which is nice as its in your room. 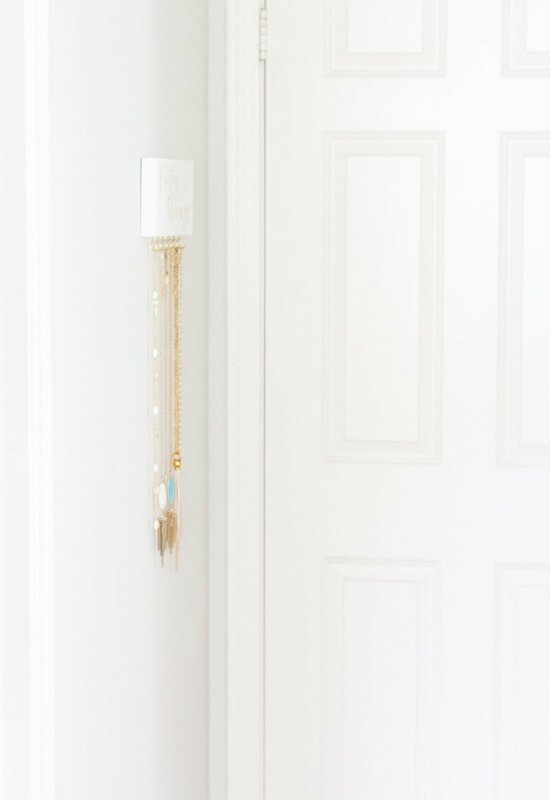 My room is small so it will also be on my dresser and l love the behind the door ideafor the long necklaces???? AND the felt idea!!! Brilliant! I’m planning on going to Homegoods today! Yay! Under $40? WOW! So happy this is coming at such a great time. Wishing you luck with your organizing project. You’ll be so happy you did it. 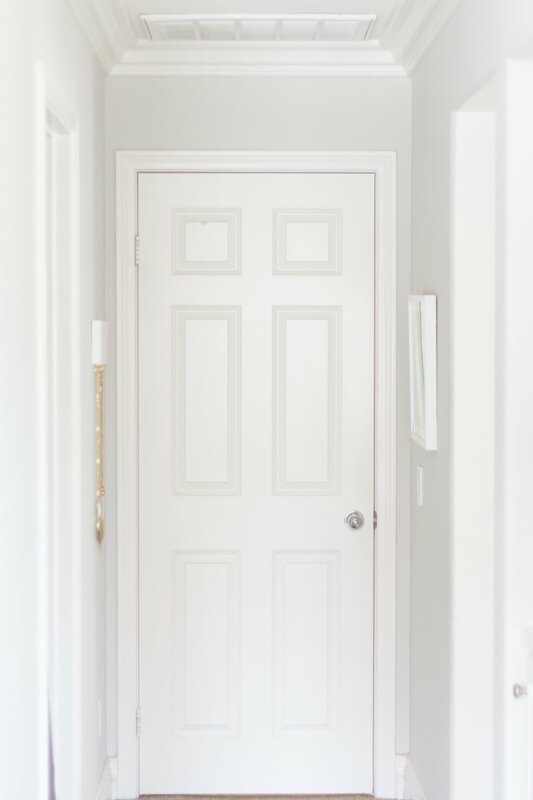 The funny thing is how behind the door has really been wasted real estate this entire time. Of course you know I am looking behind all of my doors now. Ha. I hope you have luck at HomeGoods. Have fun with it. xo Oh, and I hope you receive those earrings! 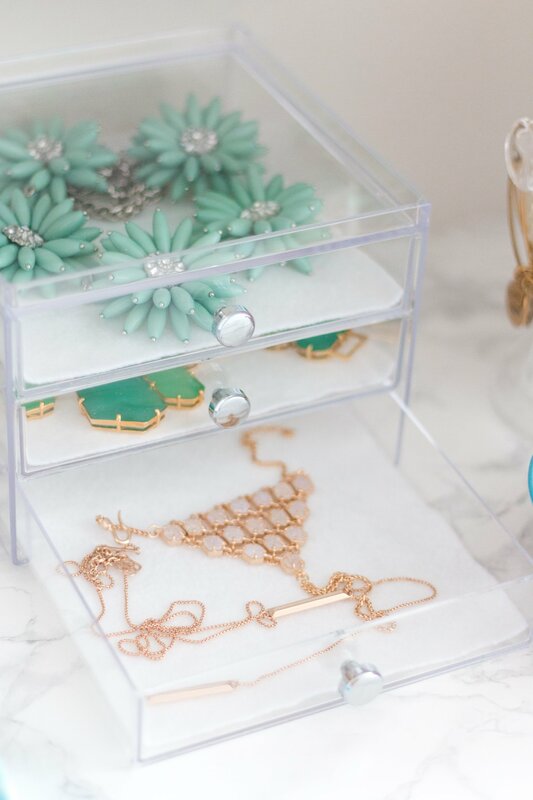 I really enjoyed both of these posts about jewelry organization! Your final result is just perfect! And thanks for the link to the acrylic necklace organizer at the Container Store, I think (a few!) of those will work for me. 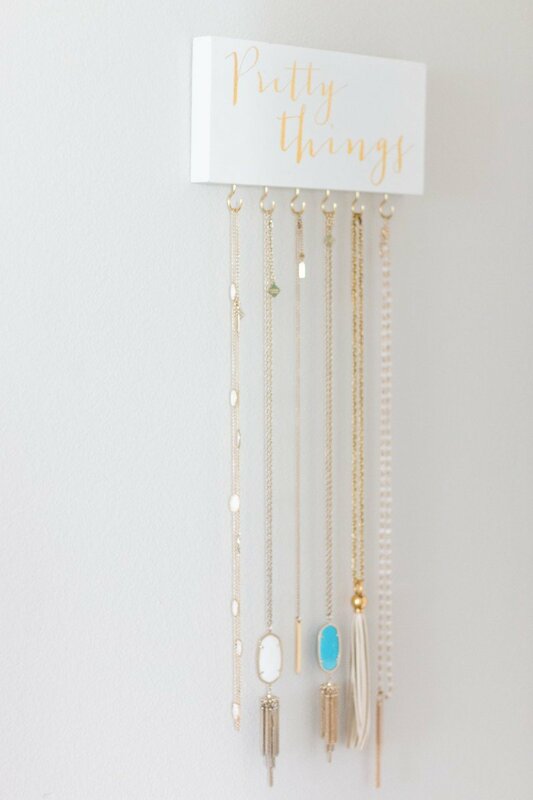 One tip I have is I tend to buy necklaces when I buy a new jacket or top, so I hang the necklace on the hanger so my outfit is all pulled together and ready to go. Storage problem solved. 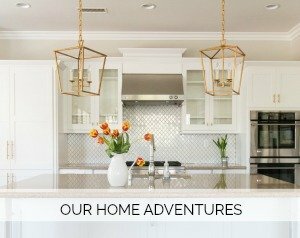 🙂 Absolutely love your blog, thanks Courtney! It looks great, Courtney and I love all of your bracelets. I purged my jewelry a few months ago but I need to do it again. It looks great Courtney! 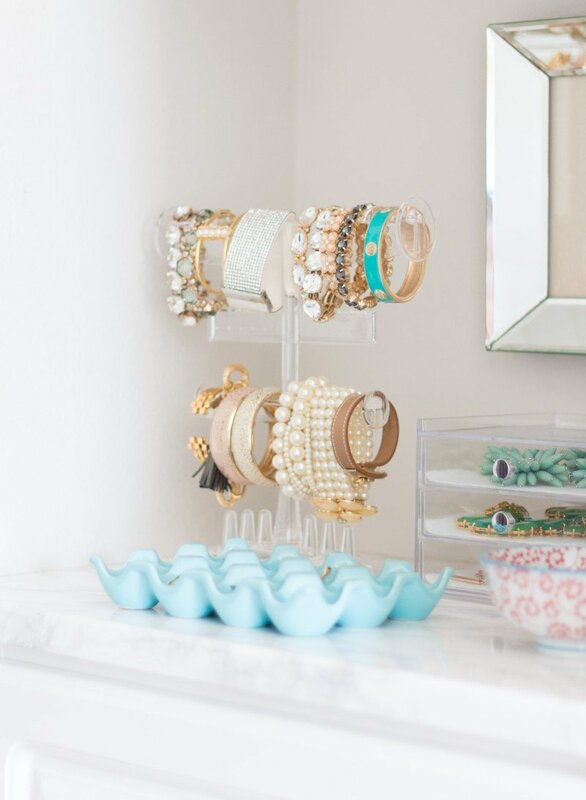 So nicely organized and love that you can easily see what you have. Lots of mine is in boxes or drawers and it would be easier if it was out and readily available. Like you’ve done! Happy Friday. I love the idea of this and have tried it in the past. Unfortunately, I found that the jewelry all gets dusty from being out in the open and requires a lot more cleaning time. Silver jewelry also tarnishes more readily.